I've decided I have a love hate relationship with our mantle. 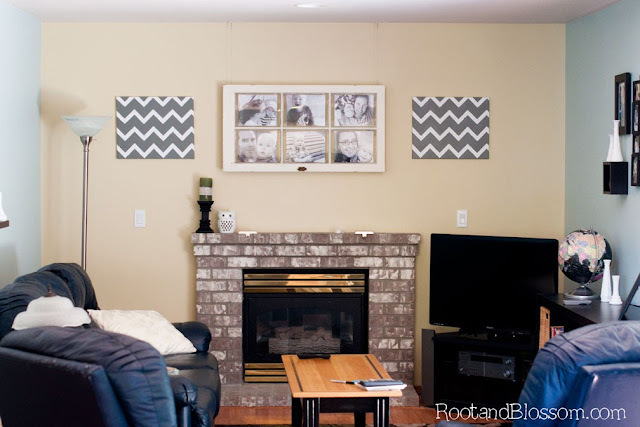 When we purchased our home back in 2011 I was very excited about having a mantle to decorate. Well two years late I come before you and admit that I don't know what the heck to do with it. It's not just the mantle but the whole wall the fireplace is against. We bought an antique window a couple years back which we hung above the fireplace and at first I really liked it but then it quickly felt plain. 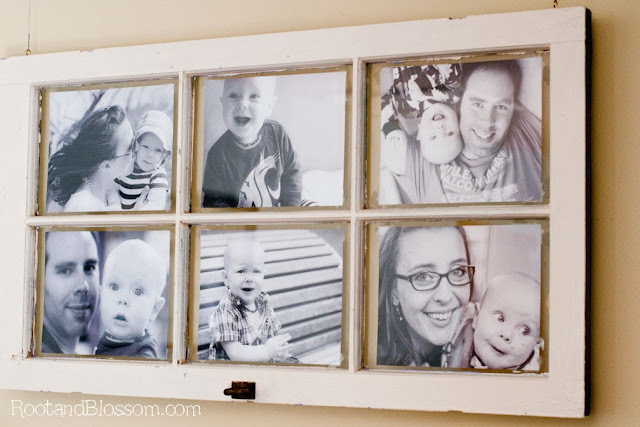 I've seen people attaching photos to these windows and I liked that idea but I couldn't figure how it was done... Once I finally found a blog about how to attach the photos it was a palm-to-head kind of moment when I read that you can just tape the photos on. I thought that would for sure be visible but it's not noticeable at all unless you're really looking. I'd advise though that you should wipe down the window first so that the tape sticks well- I didn't and mine was apparently too dusty for the tape to work. I've searched Pinterest far and wide for mantle inspiration and am still struggling. Any awesome ideas to pass my way?! Another issue is that our mantle isn't very wide- Chris wants to change the entire fire some day in the future and that problem will eventually be fixed. Speaking of changing the fire place, what is your guys' take on painted brick? I've seen some painted brick fireplaces that I just adore but I can't sell the hubs on the idea. The window looks great! I live in an apartment, so I don't have a mantle (yet! ), but my sister in law has done a great job decorating hers. She has framed pictures of all different sizes leaning against the wall on the mantle on one end, then a plate of different size candles on the other end. It looks so home-y and simple! 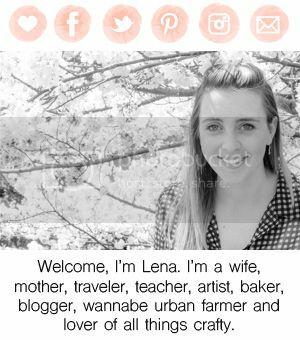 She really pulls off the "farmhouse" style, which kind of goes with your window!